The replay officials aren't doing so well in Week 13. I’m confused by a few of the replay officials here in Week 13. But I’ve been that way since I saw them scraping my face off of one of the billboards last Sunday when I was pulling into the FOX lot. I’ve seen two already Sunday that baffle me – this one took place in the Chicago-Minnesota game. Here was the situation: Chicago had the ball, second-and-10 at its own 47-yard line with 30 seconds left in the second quarter. Minnesota led 7-6. Bears quarterback Josh McCown completed an 11-yard pass to Alshon Jeffery, who went airborne to catch the ball and it was spotted at the Minnesota 42-yard line. 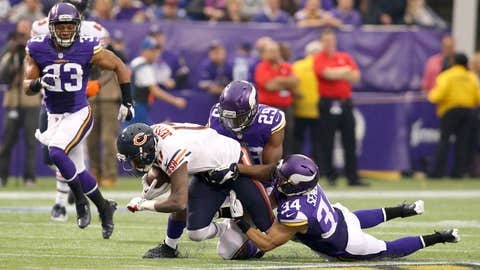 Jeffery was being defended on the play by Xavier Rhodes who made contact with Jeffery at the 43 while he was still in the air and pushed him back to the 44-yard line. After a review, the replay official reversed the spot from the Minnesota 42-yard line to the Minnesota 44-yard, making it third down and 1 instead of a first down. Yet another replay fiasco in my opinion and we’ve seen quite a few this year. The rule is, that an airborne receiver gets the forward-most point of where he is when he is touched by a defender, regardless of whether he is going forward or backward, which in this case Jeffery was the 44-yard line and the call should have remained a first down as it was called on the field. Period. It has nothing to do with completing the catch, which means getting both feet back on the ball. Airborne, with control, you get the furthest most upfield point that you are at when you are touched by a defender. Reversing this and making it short of a first down and creating a potential for a 10-second run off is just not correct.